In 1835, his father resolved that the time had come for wider audiences, and brought César-Auguste and his younger brother Joseph to Paris, to study privately: counterpoint with Anton Reicha and piano with Pierre Zimmerman. Both men were also professors at the Paris Conservatoire. 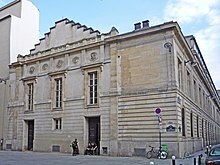 When Reicha died some ten months later, Nicolas-Joseph sought to enter both boys into the Conservatoire. However, the Conservatoire would not accept foreigners; Nicolas-Joseph was obliged to seek French citizenship, which was granted in 1837. In the interval, Nicolas-Joseph promoted concerts and recitals in Paris featuring one or both boys playing popular music of the period, to mostly good reviews. At the same time, a revolutionary change was occurring in the techniques of French organ performance. The German organist Adolf Hesse (1809–1863), a student of Bach's biographer Johann Nikolaus Forkel, had demonstrated in 1844 in Paris the pedal technique which (together with a German-style pedal board) made the performance of Bach's works possible. This was totally outside the scope of the kind of playing which Franck had learned from Benoist at the Conservatoire; most French organs did not have the pedal board notes required for such work, and even France's own great classical organ tradition dating from the period of the Couperins was at that time neglected in favour of the art of improvisation. Hesse's performances might have been treated simply as a short sensation for their dazzling virtuosity, but that Hesse's pupil Jacques-Nicolas Lemmens (1823–1881) came to Paris in 1852 and again in 1854. Lemmens was then professor of organ at the Royal Conservatory of Brussels, and was not only a virtuoso performer of Bach but a developer of organ teaching methods with which all organists could learn to play with precision, clarity, and legato phrasing. Franck appeared on the same inaugural concert program as Lemmens in 1854, much admiring not only the classic interpretation of Bach but also the rapidity and evenness of Lemmens's pedal work. Léon Vallas states that Franck, pianist before he was organist, "never wholly acquired the legato style himself"; nevertheless he realized the expansion of organ style made possible by the introduction of such techniques and set about the task of mastering them. In his search to master new organ-playing techniques he was both challenged and stimulated by his third and last change in organ posts. On 22 January 1858, he became organist and maître de chapelle at the newly consecrated Sainte-Clotilde (from 1896 the Basilique-Sainte-Clotilde), where he remained until his death. Eleven months later, the parish installed a new three-manual Cavaillé-Coll instrument, whereupon he was made titulaire, Théodore Dubois taking over as choirmaster and assistant organist. The impact of this organ on Franck's performance and composition cannot be overestimated; together with his early pianistic experience it shaped his music-making for the remainder of his life. Norbert Dufourcq described this instrument as "unquestionably the constructor's masterpiece up to this time". Franck himself told the curé of Sainte-Clotilde: "If you only knew how I love this instrument . . . it is so supple beneath my fingers and so obedient to all my thoughts!". To prepare himself for this organ's capabilities (including its thirty-note pedal), Franck purchased a practice pedalboard from Pleyel et Cie for home practice to improve his technique, as well as spending many hours at the organ keyboard. The beauty of its sound and the mechanical facilities provided by the instrument assisted his reputation as improviser and composer, not only for organ music but in other genres as well. Pieces for organ, for choir, and for harmonium began to circulate, among the most notable of which was the Messe à 3 voix (1859). The quality of the movements in this work, composed over a number of years, is uneven, but from it comes one of Franck's most enduring compositions, the communion anthem "Panis angelicus". More notable still is the set of Six Pièces for organ, written 1860–1862 (although not published until 1868). These compositions (dedicated to fellow organists and pianists, to his old master Benoist, and to Cavaillé-Coll) remain part of modern organ repertory and were, according to Rollin Smith, the first major contribution to French organ literature in over a century, and "the most important organ music written since Mendelssohn's." The group includes two of his best-known organ works, the "Prélude, Fugue et Variation", op. 18 and the "Grande Pièce Symphonique", op. 17. He was now in a position to spend time composing works for which ideas had been germinating for years. He interrupted his work on Les Béatitudes to produce (among many shorter works) the oratorio Rédemption (1871, revised 1874), the symphonic poem Les Éolides (1876), the Trois Pièces for organ (1878), and the piano Quintet (1879). Les Béatitudes itself finally saw its first performance in 1879. As with many other premiers of Franck's larger choral and orchestral works, it was not successful: the work was highly sectionalized and lent itself to performance of excerpts rather than as a whole. There was no orchestra available, and those sections that were performed were accompanied by piano. Further, even d'Indy points out that Franck seemed incapable of musically expressing an evil contrasting to the virtues expressed in the Gospel beatitudes: "This personification of ideal evil--if it is permissible to link these terms—was a conception so alien to Franck's nature that he never succeeded in giving it adequate expression." The resulting "impression of monotony", as Vallas puts it, caused even Franck's devoted pupils to speculate on Les Béatitudes' viability as a single unified work. During July 1890 (not May 1890, as previously thought), Franck was riding in a cab which was struck by a horse-drawn trolley, injuring his head and causing a short fainting spell. There seemed to be no immediate after-effects; he completed his trip and he himself considered it of no importance. However, walking became painful and he found himself increasingly obliged to absent himself first from concerts and rehearsals, and then to give up his lessons at the Conservatoire. He took his vacation as soon as he could in Nemours, where he hoped to work on the proposed organ pieces as well as some commissioned works for harmonium. During the vacation he was able to start on both projects. While Franck could not complete the harmonium collection, the organ pieces were finished in August and September 1890. They are the Trois Chorals, which are among the greatest treasures of organ literature, and which form a regular part of the repertory today. Of them, Vallas wrote: "Their beauty and importance are such that they may be properly considered as a kind of musical last will and testament." A more recent biographer, R. J. Stove, has written in similar terms: "The sense of Franck bidding a protracted good-bye is evident throughout. ... It is hard, it is well-nigh impossible, to believe that the Chorals' composer retained any illusions about his chances of full physical mending." Franck started the new term at the Conservatoire in October, but caught a cold mid-month. This turned into pleurisy complicated by pericarditis. After that, his condition rapidly worsened and he died on 8 November. A pathologist writing in 1970 observed that, while Franck's death has traditionally been linked to his street injury, and there may have been a connection, the respiratory infection by itself could have led to a terminal illness. Given the then lack of antibiotics, this "could not be considered an unusual pattern for pneumonia in a man in his seventh decade." But this verdict has been subsequently queried: "no doubt about the 'proximate cause' was ever voiced by the two persons most likely to know, namely, Franck and his wife; nor was such a doubt ever voiced by those outside Franck's immediate household who dealt with him between July and early November 1890. ... Franck's punishing workload, 'burning the candle at both ends' over decades, could well in itself have impaired the bodily resilience he needed to fight off even a minor injury." The funeral mass for Franck was held at Sainte-Clotilde, attended by a large congregation including Léo Delibes (officially representing the Conservatoire), Camille Saint-Saëns, Eugène Gigout, Gabriel Fauré, Alexandre Guilmant, Charles-Marie Widor (who succeeded Franck as professor of organ at the Conservatoire) and Édouard Lalo. Emmanuel Chabrier spoke at the original gravesite at Montrouge. Later, Franck's body was moved to its current location at Montparnasse Cemetery in Paris, into a tomb designed by his friend, architect Gaston Redon. A number of Franck's students, led by Augusta Holmès, commissioned a bronze medallion from Auguste Rodin, a three-quarter bust of Franck, which in 1893 was placed on the side of the tomb. In 1904, a monument to Franck by sculptor Alfred Lenoir, César Franck at the Organ, was placed in the Square Samuel-Rousseau across the street from Sainte-Clotilde. As an organist he was particularly noted for his skill in improvisation, and on the basis of a mere twelve major organ works, Franck is considered by many the greatest composer of organ music after Bach. His works were some of the finest organ pieces to come from France in over a century, and laid the groundwork for the French symphonic organ style. In particular, his early Grande Pièce Symphonique, a twenty-five-minute work, paved the way for the organ symphonies of Charles-Marie Widor, Louis Vierne, and Marcel Dupré, and his late Trois Chorals are a cornerstone of the organ repertoire, featuring regularly on concert programs. As part of the 2017 Proms Season the symphonic poem Les Djinns (inspired by the poem Les Djinns by Victor Hugo) was performed by Les Siècles orchestra with conductor François-Xavier Roth and soloist Cédric Tiberghien. The broadcast of the performance, by BBC Radio 3, was preceded by a talk by Turkish novelist Elif Şafak who discussed the figure of the djinni in Arabic mythology. ^ Hildebrandt, Vincent. "Orgue Cavaillé-Coll Ste-Clotilde Paris". www.orgue-clotilde-paris.info. Retrieved 16 August 2017. ^ "Auguste Rodin - Biography". www.rodin-web.org. Retrieved 16 August 2017. ^ "Prom 42: Les Siècles and François-Xavier Roth, 2017, BBC Proms - BBC Radio 3". BBC. Retrieved 16 August 2017. "Franck, César" . Encyclopædia Britannica (11th ed.). 1911. This page was last edited on 17 April 2019, at 14:57 (UTC).